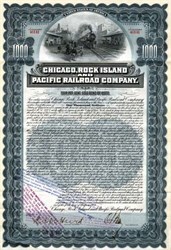 Beautifully engraved certificate from the Chicago Rock Island and Pacific Railroad Company issued in 1902. This historic document was printed by the American Banknote Company and has an ornate border around it with a vignette of a train arriving at the station. This item is hand signed by the Company’s Vice President and Assistant Secretary and is over 111 years old. Over 150 unused bond coupons are attached to bond on top and are not shown in the scan. Liquidation stamps. XF. 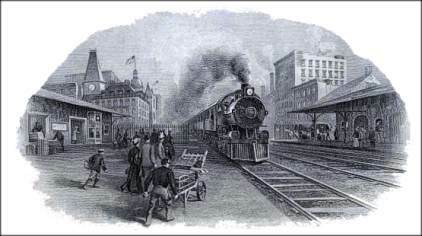 Originally chartered in Illinois on February 27, 1848, as the Rock Island and LaSalle Rail Road Company, the road was renamed Chicago and Rock Island Rail Road Company on February 7, 1851, and Chicago, Rock Island and Pacific Railroad Company in 1866. In Texas the Rock Island operated 633 miles of main track plus joint ownership of the Burlington-Rock Island. Three main Rock Island routes crossed the state. The Midcontinent Route ran from Minneapolis-St. Paul to Fort Worth and Dallas and, with the Burlington-Rock Island, to Houston and Galveston. The other two main lines connected with the Southern Pacific at Tucumcari, New Mexico, to form through routes to the Pacific Coast. These were the Golden State Route, running from Chicago and Kansas City through Dalhart, and the Choctaw Route, which ran from Memphis and Oklahoma City through Amarillo. In addition to its Texas routes, the Rock Island also served the major railroad centers of St. Louis, Missouri, and Denver, Colorado. Two of the named passenger trains of the Rock Island operating across Texas were the Twin Star Rocket and the Golden State Limited. The Chicago, Rock Island and Pacific Railroad was incorporated under the laws of Iowa on July 31, 1902, to construct or otherwise acquire a line of railway from Davenport to Council Bluffs, Iowa, to purchase, lease, or otherwise acquire, either directly or through ownership of the corporation owning or operating the same, the railways, property, and franchises of the carrier and other lines of railway property in Iowa and in other States; to maintain and operate any of the lines of railway and railway property it might acquire, and to operate under lease or other contract lines of railway owned or operated by other corporations. In May, 1903, the company acquired all of the outstanding capital stock of the Des Moines Southern Railway Company, which was incorporated June 20, 1901, under the general laws of Iowa, by local interests independent of any railroad, for the purpose of constructing a railroad from Winterset to Greenfield, Iowa. At the same time, the Chicago, Rock Island and Pacific Railroad obtained possession of all the right-of-way lands that company had acquired.